Alciato at Glasgow: Emblem: Duodecim certamina Herculis. Link to an image of this page [K3v p150]Spernit avaritiam, nec rapto aut foenore gaudet. Vincit, foemineos spoliatque insignibus actus [=astus] . Expurgat sordes, & cultum mentibus addit. Barbaries, feritasque dat impia denique poenam. Docta per ora virum volat, & non interit unquam. Eloquence surpasses the fame of untamed strength and unravels the sayings of sophists and their vain tricky problems. No rage nor madness of any sort has more power than virtue. Because of his continual exertion, wealth comes the way of the wise. Virtue scorns avarice and takes no pleasure in theft or usury. It overcomes the wiles of women and robs them of their triumph. It cleans out filth and brings culture to the mind. It hates illicit unions and repels them, with all their harm. Barbaric acts and godless savagery in the end pay the penalty. The virtue of one man scatters massed enemies. Virtue brings many good things from abroad to its own country. It passes from one man’ learned lips to another’s and does not perish ever. 1. Hercules was accredited with many victories over men and monsters, but eventually a list of twelve major ones was compiled. See e.g. Anthologia Graeca, 16.92. These ‘Labours’ he carried out at the behest of Eurystheus, incited by Hera (see next emblem, note 2). Alciato’s epigram follows this order: i. the Nemean lion; ii. the Hydra; iii. the Erymanthean boar; iv. the golden-antlered Arcadian stag; v. the birds of the Stymphalian Marsh; vi. the belt of Hippolyta, Queen of the Amazons; vii. the Augean stables; viii. the Cretan bull; ix. the mares of Diomedes; x. the cattle of the three-bodied giant Geryones (see Emblem 40 [A50a040]); xi. the golden apples of the Hesperides; and xii. the three-headed watchdog Cerberus. The Labours were given various allegorical interpretations both in antiquity and later, and Hercules himself becomes a wise man and philosopher, overcoming folly and sin. See Emblem 180 ([A50a180]). 2. docta per ora virum volat, ‘It passes from one man’s learned lips to another’s’. Cf. the epitaph of the poet Ennius (Epigrams, Loeb edition, p. 402): ‘volito vivus per ora virum’ (still living, from one man’s mouth to another I fly). Los Emblemas (1549), Lyon: Los trabajos de Hercules alegorizados. 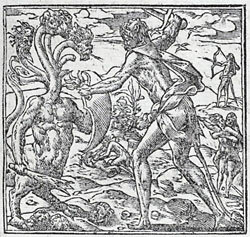 Emblemes (1549), Lyons: Les douze labeurs de Hercules, par Allegorie. Emblemata (1551), Lyon: Duodecim certamina Herculis. Toutes les emblemes (1558), Lyon: Les douze labeurs de Hercules, par Allegorie. Liber emblematum ... Kunstbuch (1567), Franckfurt am Main: Duodecim certamina Herculis. Die zwelff Kampffstück Herculis außgelegt. Emblemata / Les emblemes (1584), Paris: Duodecim certamina Herculis. Les douze labeurs d'Hercules allegorisez. Emblemata (1591), Leiden: Duodecim certamina Herculis. Declaracion magistral sobre las Emblemas de Andres Alciato (1615), Najera: DUODECIM CERTAMINA Herculis. Les emblemes (1615), Geneva/Cologny: Les douze combats d'Hercules par allegorie. Emblemata (1621), Padua: Duodecim certamina Herculis.